As any visitor to Scotland will know, the capital city of Edinburgh is at the top of the list of places to visit thanks to famous attractions like Edinburgh Castle, The Royal Mile, Holyrood Palace and the Scottish National Gallery, all of which are within a short walking distance of each other. The downside of having such a compact city is that tourists usually just cram a few days of sight-seeing into their holiday before heading off to tour the Highlands or the Western Isles, never to explore any further outside of Edinburgh than the airport. But failing to venture into the areas surrounding the city is a classic mistake that can lead to people missing out on some of the best attractions that Scotland has to offer. While Edinburgh has plenty of travel options to cater to visitors thanks to frequent (and cheap) buses, taxis-galore and more tourist coaches than you can shake a selfie stick at, the best way to experience the nearby countryside is by self-drive car. A car opens up so many opportunities and not only can you come and go as you please, but driving a car means you can stop as frequently as you like, for as long as you like, where you like. And let’s be honest, while your average tour guide will just take you to the same attractions as everyone else, a hire car with a sat nav can take you off the beaten track for less money, and with a bucket-load more convenience. It’s with these thoughts in mind that this guide has been put together so that you too can get out onto the open road to explore Scotland with a minimum of fuss and a maximum of adventure, and even better, all of these attractions have been recommended by travel blogger Sonja from Migrating Miss. You can read more about her Edinburgh travel adventures with her hire car on the Avis website here. While you won’t be able to visit every attraction in this guide in one day you will at least be able to visit one or two of them if you have a car to hand, and there’s no reason why you couldn’t spend an entire holiday exploring the suggestions outlined below. So without further ado let’s delve into the wilds of Scotland armed with a full tank of fuel and this guide for assistance, for a Scottish adventure that will take you off the standard tourist trails and into some of the best attractions that this amazing country has to offer. While most visitors driving towards Stirling might only point a surprised finger at the two enormous horse heads they briefly see as they zoom past Falkirk, those in the know will take a short detour to investigate what the enormous metal artworks are all about. The impressive sculptures were actually installed to celebrate the story of the heavy horses that towed barges up and down Scotland’s canals in the 19th-century, in the days when canals provided the main transport route for the heavy loads of coal that powered the nation’s industry. Ever-wary of the dangers of the water, many canal workers paid their respects to the kelpies (traditional Scottish water spirits), and so a mix of Clydesdale horse and kelpie seemed like the most appropriate symbol to commemorate this long-lost part of Scotland’s history. In Scottish folklore a kelpie can change into several different animals, but it’s the form of the powerful water horse that was most revered. Blessed with the strength and stamina of ten normal horses, a kelpie perfectly represents Scotland’s rich industrial heritage, which is why the enormous 30-metre tall horse-head sculptures were installed on this part of the Forth and Clyde canal in The Helix. ‘The Helix’ is actually the name given to the area around Falkirk that was transformed from a brownfield site into a thriving urban green landscape in 2005, and there’s a huge amount of things to do on the 860 acres of land that it covers. Helix Park (the centre of the Helix) contains a huge performance area where concerts are regularly held, and a giant lagoon nearby offers nearly every watersports activity you can think of. There are also around 17 miles of cycles paths to get out and about on in The Helix, so if you’re intending to get there by car it might be an idea to put your bikes on a cycle rack first. It’s totally worth taking the short drive from Edinburgh to get there, and best of all it’s completely free! Take a look at the Out About Scotland guide to The Kelpies here. From Sonja “I always look out for the Kelpies if I’m driving along the M9 as they’re right next to the road, but the glimpse you get is too fleeting to fully appreciate their majesty. Keep an eye out for the exit at Junction 5 that comes before the statues, and then follow the brown tourist signs until you arrive at Helix Park. There are two car parks to choose from. A free one is around a 20-minute walk away, while the other charges between April and October but is right next to the Kelpies. The Kelpies you see today are two 30 metre, 300-tonne horse heads made of painstakingly placed three metre high pieces of steel. They have already become one of the most photographed pieces of public art in Scotland since they opened in 2013, and rightly so. The Engine Shed near Stirling is one of those attractions which your average tourist would never visit, and yet it offers an experience that’s completely different amongst the other attractions in the area. Maybe using the word ‘attraction’ isn’t the best way to describe the Engine Shed. Informative entertainment perhaps (infortainment?). Whatever, it’s a great way to kill a couple of hours if you’re in the Stirling area. Operated in conjunction with Historic Environment Scotland, the body that seeks to preserve Scotland’s heritage, The Engine Shed features a diverse selection of exhibits that explain the stories behind the buildings that are as much a part of the country’s history as its people. Using lots of fun and informative types of media such as 3D theatre, interactive displays, hands-on activities and augmented reality, visitors can learn about the stories of Scotland’s historic buildings and the people who built them, used them, and lived in them. And it’s not just kids who will enjoy getting hands-on with events like Lego construction and 3D printing because adults can get involved too, with demonstrations of traditional building techniques and metalwork regularly held inside the education centre. If you want to learn a little bit more about Scotland’s history at a truly unique attraction, then The Engine Shed in Stirling is definitely the place to go. From Sonja “Fantastic for children and adults alike, the ideal place to start your exploration of Stirling is The Engine Shed. A dedicated building conservation centre, it houses a hands-on museum and exhibition space covering how the historic buildings of Scotland were built, and are now maintained. It’ll give you the perfect insight into the abundance of historical architecture you can expect to see on your journey through Scotland. There surely can’t be a historical site in Scotland that has had such a recent surge in visitor numbers as Doune Castle in Perthshire, and it’s the author Diana Gabaldon who can be thanked for the explosion of interest in the attraction, due to her recently televised bodice-ripping tales of time travel in 18th-century Scotland. The TV and book series ‘Outlander’ tells the story of Claire, a WWII nurse who gets transported back in time to 1743 and gets embroiled in the ill-fated Jacobite uprising, alongside her impossibly buff husband Jamie. And it’s here at Doune Castle where much of the filming for the extremely popular first season took place. But there’s more to this historic building than TV shows. Built in the 13th-century, the castle was at one time the official residence of the Duke of Albany and was a showcase for his wealth and power. That’s something that can be clearly seen as you make your way through the maze of rooms and corridors inside the castle, with enormous spaces like the Great Hall giving you some idea of the importance that was given to entertaining guests back in those days. Stepping outside into the huge walled courtyard not only makes you realise how well fortified this castle is, but also how dangerous those medieval times must have been to have needed such massive walls in the first place. It certainly makes you thankful to be a modern-day visitor to Scotland where the most dangerous thing you’ll encounter is a swarm of midges on the west coast. A morning or afternoon spent in Doune will leave you with enough time to venture into the nearby city of Stirling to explore Stirling Castle, a royal residence that was at one time even more important than Edinburgh Castle. Check out the Historic Environment Scotland website for further details. 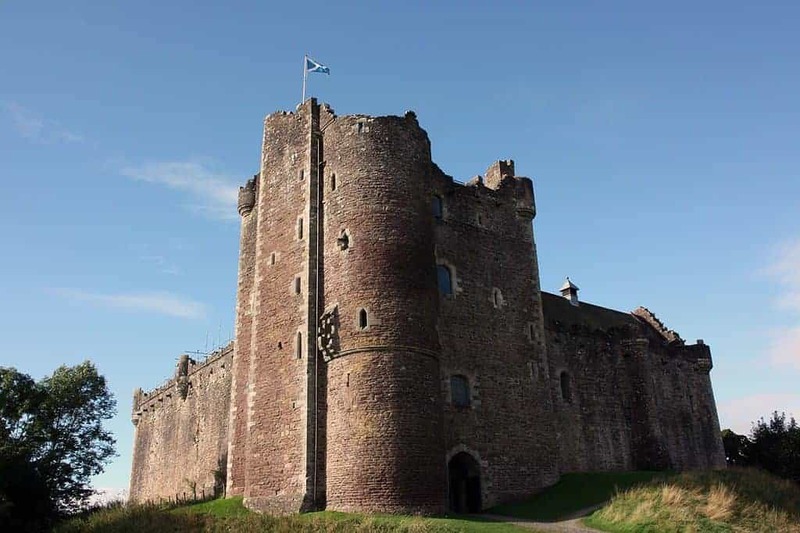 Take a look at the Out About Scotland guide to Doune Castle here. From Sonja “I first visited Doune Castle on the strong recommendation of a friend. Given the castle is intact, rather than ruins, it provided her with a more authentic experience than others in Scotland. Yet, it remains less well-known than its Scottish counterparts so there are no long queues for certain parts or ropes blocking certain pathways. One visit later, and her recommendation was verified. I’ve been steering people to Doune Castle ever since! Despite its more recent fame, Doune Castle has much more to offer than being a fantastic filming location with its rich history. Inside its walls, you’ll find an elaborate, well-preserved (or, in some cases, restored) labyrinth of rooms, large and small, connected by spiral staircases, narrow corridors, and low-hanging doors. If you’re looking for respite from the hustle and bustle of Edinburgh, a short drive to Loch Lomond and the Trossachs National Park will give you all the scenery and fresh country air you’re looking for. This part of Scotland has been popular with tourists and locals alike for many years thanks to its wild glens, mighty Munro’s (a mountain over 300 feet high), scenic viewpoints and gentle lochs. In fact, if you’re looking for a real taste of rural Scotland there’s really no need to go anywhere else. Loch Lomond is the largest inland stretch of water in Britain and runs north from the peaceful town of Balloch for over 24 miles into the Scottish highlands. Home to over 30 small islands, Loch Lomond has a huge array of activities for visitors to take part in, whether it’s taking a boat out to its islands, canoeing across its waters or simply cycling around its shore-side tracks. And if you can brave the cold you might even be tempted to take part in the Great Scottish swim which is held in Loch Lomond each year in August, an event where much braver souls than me splash their way across the loch in aid of charity. Check out the event website here. While you’re visiting Loch Lomond it’s well worth taking a slight detour to head slightly north of Balloch to the pretty little village of Luss. This conservation village has been occupied since medieval times, although the quaint flower-covered cottages that line its streets today weren’t built until much later in the 18th and 19th-centuries. A walk around the quiet roads of this village lets you take a glimpse into how life might have been when the occupants of these dwellings were employed by the nearby slate quarries, and if you want to see where these yester-year residents worked you can follow the slate quarry path which will lead you through the old mills and stone works. The village of Luss is one hidden gem in Scotland that you really owe it to yourself to take a journey to. From Sonja “Alongside Loch Lomond, resting on the western shore sits the scenic village of Luss. It’s a popular stop for those wanting to explore more of the Loch Lomond area. Charming rows of cottages from the 18th and 19th centuries wind down to the shores of Scotland’s famous loch. With the impressive Ben Lomond towering behind, it’s one of the prettiest views in Scotland. Loch Lomond, combined with the Trossachs National Park, is the gateway to the west of Scotland, and I love driving through this area as I venture up the country. There are several routes you can take. These include the fast-paced journey north through Callander and the upper corner of the Trossachs, and the more leisurely route west around Loch Lomond itself. Time permitting, I’d opt to go via the second route taking in Luss! The busy town of Callander is one of the few places in this itinerary where you’ll probably be rubbing shoulders with lots of fellow tourists whatever the weather and no matter the time of year. But it’s popularity is totally justified and as it’s such a short drive from Edinburgh it simply has to be included. A natural starting point for walkers heading out into the Trossachs National Park, Callander has developed into a tourist-friendly town with enough walking and cycle routes to keep the average family entertained for weeks on end, let alone anyone heading there for a day-trip by car. Popular natural attractions like the Bracklin Falls beauty spot are easily reached from the town centre and hikers are generously rewarded with gorgeous scenery thanks to the woodland, glens and rivers that can be found throughout the area. Bracklin Falls in particular is well worth making the journey to Callander for, and the roaring waterfalls that thunder through the Keltie Burn are absolutely idyllic at any time of the year. Just make sure that you’ve got a decent pair of boots on your feet and a raincoat in your backpack for the changeable Scottish weather. This town offers yet another reason to get that cycle rack out of the garage and loaded onto the car because the route along the old railway line that once connected Oban to Loch Lubnaig is seriously good for cycling along. Following the River Leny, the track passes the Falls of Leny (an impressive waterfall near the village of Kilmahog), Ben Ledi (the highest mountain in the Trossachs) and the very peaceful Loch Lubnaig. Perfection! From Sonja “Surrounded by a beautiful array of hills and at the junction of two rivers, Callander is the starting point of many stunning walks and a great base to enjoy the tree-covered Callander Crags. For many visitors, it feels like the first real taste of the Highlands as they head north because it’s where the scenery becomes visibly dramatic. The town of Callander is a collection of tightly packed houses and hotels, many of which have been there for hundreds of years. These wonderful old streets are now full to the brim with various shops to delve into and find the perfect memento of your trip. To keep your energy levels high you can enjoy excellent food in an abundance of local eateries, from delicious delis to more traditional pubs and tea rooms. Glencoe doesn’t really need any introductions as it’s one of the most visited locations in Scotland. But that doesn’t mean you have to get stuck amongst swarms of excitable tourists, thanks to the fact that the area is so vast that it’s easy to get some alone time in the wilderness. And while the journey to the glen from Edinburgh makes for quite a long day, it’s a journey that’s well worth taking. This historic part of Argyll was formed by an ice-age glacier that cut through the volcanic peaks that line either side of the glen for nearly 8 miles, and today, Glencoe’s combination of lochs, mountains and lightly wooded glens has made it one of the highest-rated attractions in Scotland. There’s certainly enough jaw-dropping scenery at Glencoe to keep any selfie-loving tourist busy, but perhaps the best viewpoint is from the top of one of the Three Sisters, the three peaks that collectively make up the Bidean nam Bian mountain range. There are several routes that can take you to the tops of the peaks but one of the most interesting paths begins at the visitor car park at Loch Achtriochtan. From here you can follow the two-and-a-half mile track up into the mountainside as it passes waterfalls, rock faces and hidden plateaus. It takes a bit of effort to get up there but believe me, if you want to be gobsmacked by one of the most incredible views you’ll ever see anywhere, then a hike up Bidean nam Bian is a must. Take a look at the Out About Scotland guide to The Glencoe Exhibition Centre here. 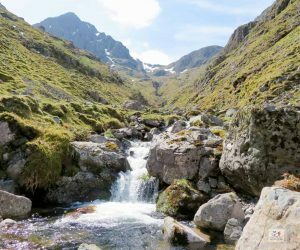 For further information about Bidean nam Bian check out the Out About Scotland guide here. From Sonja “The drive through Glen Coe is one of Scotland’s most scenic road trips, world-famous for its beauty and a must-see for all visitors. Visually, it’s everything you could want from a Highlands adventure; towering mountains, gorgeous glens, waterfalls, and wildlife. On a one-day road trip out of Edinburgh, time is tight, but Glen Coe shouldn’t be missed as it encapsulates the best of Scotland. It’s easily one of my favourite places in Scotland and, although it’s a bit further from Edinburgh than other stop-offs, it’s worth every moment to see it. If you’ve followed this guide through its earlier stages you’ll have already visited Doune Castle, the location for some of the filming for the Outlander TV series, and if you’re in the mood for even more Outlander experiences you should take the short drive across the Forth Road Bridge from Edinburgh to the cobbled streets of Culross village. Acknowledged as the most picturesque village in Scotland, stepping into Culross (pronounced coo-ross) really is like stepping back in time. The winding, narrow streets of this 17th-century seaport meander lazily through the village towards Culross Palace, an ochre-coloured building that has been the focal point for this hamlet since its construction in 1611, and while it’s not really a ‘Palace’ as you might think of one, it’s still an impressive building. Pine-panelled walls and painted ceilings give you a glimpse into how it would have looked in its prime and the fully restored interior (courtesy of National Trust Scotland) is well worth a look, as is the 17th-century garden behind the main building. The walk through the fruit trees and herb gardens is a great way to spend an hour or two before stopping for a well-earned coffee and cake at the nearby tea rooms. Just remember to save some cake crumbs for the Scots Dumpy hens back in the palace gardens. From Sonja “When I first moved to Edinburgh, I spent a lot of time heading north-west, towards the islands, the Highlands, and the impressive scenery that had drawn me to Scotland in the first place. Little did I know that much closer to home, just over the Firth of Forth from Edinburgh, is the Kingdom of Fife, the home of Scottish Kings for over 500 years. Although it took me longer to explore this underrated destination, once I had discovered the quaint villages of this Lowland county it became apparent what an amazing hidden gem the area is. Disclaimer – Sonja from the Migrating Miss blog was asked to write a guide about the attractions within a one-day car journey from Edinburgh by car hire company Avis, and together with developers Syzygy they put together a great itinerary that you can check out on the ‘Inspires by Avis’ page here.